Every Yaris Sedan offers room for up to five people without sacrificing anyone’s comfort. Standard convenience, technology and safety abound as well. For 2017, all models are enhanced with a low-speed Pre-Collision System, making this subcompact sedan even safer. From any angle, the Yaris Sedan exudes a spirit of fearless discovery. It’s the small car for expressing one’s personal style, with a bold, electric design. From its sculpted front end to its athletic, chiseled lines and profile, Yaris Sedan’s aerodynamic exterior looks like it’s always in motion. Slide inside, and Yaris Sedan offers more than meets the eye. With a stylish, technologically impressive interior boasting rich, smooth surfaces and metallic accents, Yaris Sedan sets a unique mood – combining premium comfort with an exciting, modern feel. The driver-focused design, and ergonomically ideal seating helps beat fatigue on long drives. While ample legroom and interior space are enjoyed by passengers in front and back. The Yaris Sedan is the fun-size sedan. It’s a blast to drive, with light, natural responsiveness and precise feedback. And it embodies urban sophistication: With overall dimensions and a tight turning radius that make it perfectly sized for any city, Yaris Sedan navigates streets and laneways with ease and style. A 1.5L four-cylinder engine and choice of models with either a six-speed manual or a six-speed automatic transmission gives Yaris Sedan confident acceleration and impressive fuel efficiency – at 6.7L / 100 KM city/highway combined for the manual and 6.4L / 100 KM city/highway combined for the automatic. Electric power steering, front wheel drive and carefully tuned suspensions deliver agile handling. 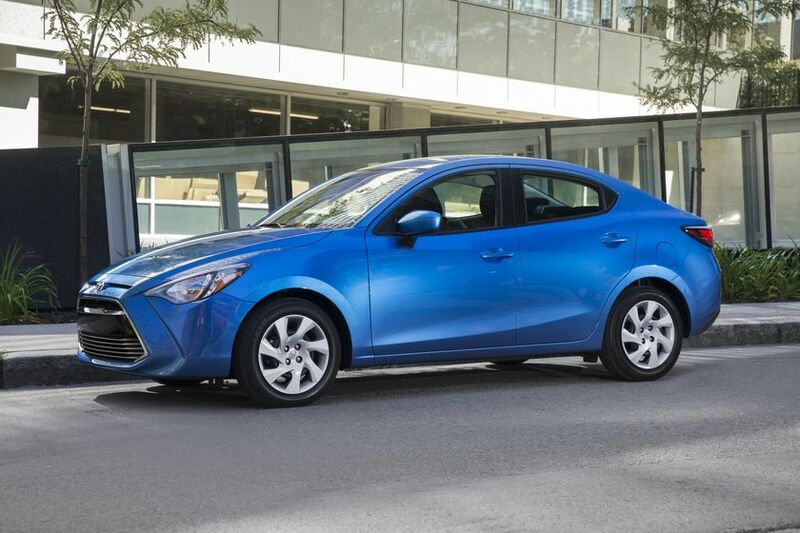 The Yaris Sedan is the subcompact that’s big on safety, too – with a body structure crafted from high-tensile steel, a comprehensive safety system featuring six advanced accident avoidance technologies, six airbags, and more. 2017 Toyota Yaris Sedan, in a choice of transmissions: manual (starting MRSP: $17,315) or automatic (starting MRSP: $18,520). 2017 Toyota Yaris Sedan Premium (starting MRSP: $20,525) with a six-speed automatic transmission. All models are very well equipped. The Yaris Sedan features an audio system with USB input, Bluetooth capability and steering wheel-mounted audio controls, air conditioning, adjustable front seats, a 60/40 split fold-down rear seat, power door locks and windows, dual vanity mirrors, cruise control, keyless entry and Push Button Start, 16” steel wheels, dual power adjustable and heated exterior mirrors, mud guards and more. The Yaris Sedan Premium enhances this smart and stylish small car with many upscale features, including a six-speaker Display Audio system with 7” screen, heated front seats, a back-up camera, 16” aluminum alloy wheels and fog lamps.